Population of Asia-Pacific region is growing at a fast pace, and simultaneously the growing food demand. APAC has highest agricultural fields, and has large highest amount of agricultural produce. To increased agricultural productivity as per the demand, it is necessary to combat the impact of the weed and various plant diseases over the large farms which is thus required to be addressed by the application of robotics in plant pathology and management. Advancing technologies and changing online landscape i.e. cloud based solutions, IoT (Internet of Things), AI (artificial intelligence), machine learning, laser technologies and GPS (global positioning system) are largely driving the growth of crop maintenance robots market. Adoption of agricultural robots in APAC is still at budding stage. Countries such as India where 50% people occupation is farming are not capable enough to afford robots. Thus, only with the rising government initiatives towards increasing productivity, there are growth opportunities for crop maintenance robots. For crop maintenance, remote controlled robots and pre-programmed robots had the largest application of all other types of robots due to their lower cost and easy application. AI and machine learning based robots are yet in nascent stage of development and have high cost, thus farmers have high resistance in their adoption and it is expected to take another 15 years for its high adoption. Goldstein Research analyst forecast that the Asia-Pacific crop maintenance robots market is set to reach nearly USD 0.84 billion by 2024, growing at a CAGR of 15.3% over the forecast period (2017-2025). Unmanned ground robots accounted for largest market share of 60.1% in 2017 on the back of its vast application and only option among the farmers. Further, unmanned aerial robots have increasing application in agriculture sector due to trend of precision farming and being cost effective as compared to UGR. Thus over the forecast period UAR are expected to grow at fastest growth rate of 15.6%. Based on fuel type, battery powered robots accounted for largest market share of 85.4% in 2017 and they are highly preferred over the solar powered robots due to the climate uncertainities. Based on geography, China accounted for largest market share of 33.5% in 2017 due to the large adoption of advanced technologies leading to use of agricultural robots. Japan closely follows the China market share in crop maintenance robots market due to presence of large manufacturing industry of robotics. India is expected to grow at a CAGR of 11.3% over the forecast period on account of developing economy and rising inclination towards adoption of advanced technologies. The report covers the present ground scenario and the future growth prospects of the crop maintenance robots market for 2017-2025 along with the market players’ analysis. We calculated the market size and revenue share on the basis of revenue generated from major players in the Asia-Pacific region. Asia-Pacific Crop Maintenance Robots Market Outlook 2017-2025, has been prepared based on an in-depth market analysis from farm market experts. 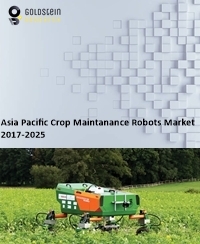 The report covers the competitive landscape and current position of major players in the Asia-Pacific crop maintenance robots market space. The report also includes porter’s five force model, SWOT analysis, company profiling, business strategies of market players and their business models. “Asia-Pacific Crop Maintenance Robots Market Report” also recognizes value chain analysis to understand the cost differentiation, pricing models to provide competitive advantage to the existing and new entry players. Our Asia-Pacific crop maintenance robots market report comprises of the following companies as the key players: Harvest Automation, Inc., Clearpath Robotics, PrecisionHawk, Inc., Deere & Company, Trimble, Inc, AgJunction, Inc., AGCO Corporation, iRobots, Case New Holland, etc.